Quiroh is a contemporary sans serif typeface created by Rebeca Hurst and published by The Northern Block Ltd. which is available in 7 weights, almost 500 characters and useful OpenType Festures. It is a mix between two movements, romanticism & industrialism and it merge well on editorial, poster, print, text, web. 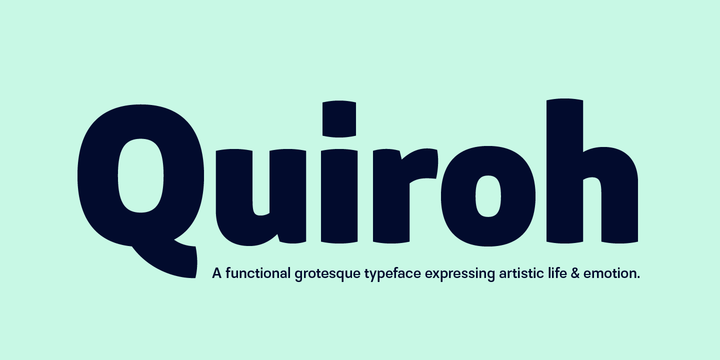 Note: “Quiroh” is a trademark of Northern Block Ltd.
Price: starting from $32 for one font to $160 for all 7 fonts. A font description published on Monday, March 28th, 2016 in Fonts, Rebecca Hurst, The Northern Block by Alexandra that has 2,475 views.